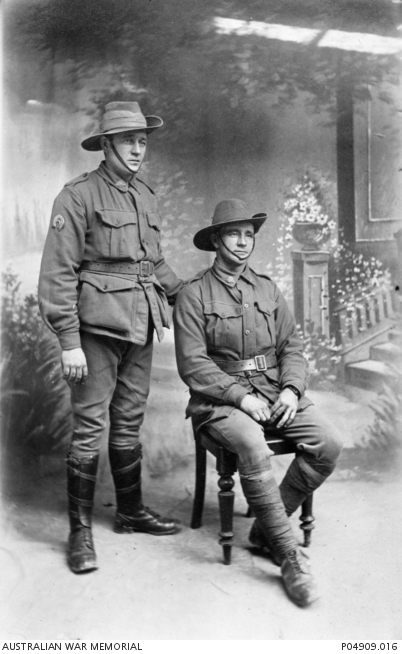 Studio portrait of two soldier brothers, Gilbert and Robert Lunan Gordon, of Leichhardt, NSW. On the left is 12467 Driver Robert Gordon AASC and on the right is 6192 Private (Pte) Gilbert James Alexander Gordon 24th Battalion. Pte Gordon embarked with the 17th Reinforcement, from Sydney on HMAT Argyllshire (A8) on 13 October 1916. He was killed in action on 4 October 1917, aged 27. This is a photograph from Sister Imlay’s collection held in the Private Records Collection at PR87/107.